Musicians: Lani Hall (vocals), Joe Chemay (bass), Neil Stubenhaus (bass), John Robinson (drums), Michael Landau (guitar), Michel Colombier (piano, synthesizers), Randy Kerber (piano, synthesizers), K.C.Porter (synthesizers), Paulinho Da Costa (percussion), Herb Alpert (trumpet solo on 1), Jose Feliciano (vocals, guitar on 6), Roberto Carlos (vocals on 2). 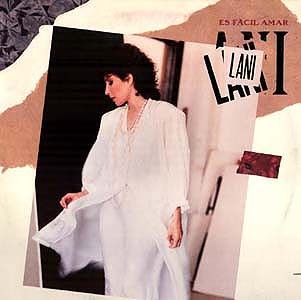 The last of Lani Hall’s solo albums of original material for AyM, ES FACIL AMAR would provide her with her greatest acclaim. Winning a Grammy for Best Latin Pop Performance, the album was produced by songwriter Albert Hammond, perhaps best known in the US for providing us with that famous line, “It Never Rains In Southern California.” Hammond wrote seven of the tunes here; the most recognizable one to Americans being “Si Me Amaras”, released here as “When I Need You”. Herb Alpert provides a great trumpet solo on the title track, “Es Facil Amar”, while Lani again duets with two of Latin music’s biggest stars, Roberto Carlos on “De Repente El Amor, and Jose Feliciano on “Un Amor Asi.” An interesting note about the duets is that while Lani’s vocal tracks were recorded at A&M studios in Hollywood, Roberto Carlos’ track was done in Rio De Janiero, and Jose Feliciano’s were laid down at another Hollywood studio. Old friend Michel Colombier is here as well arranging and playing the piano, continuing the long relationship with Lani dating back to his WINGS album and her first solo album “SUN DOWN LADY.” As with the previous two Latin efforts, Lani’s work here is superb and the Grammy was well-deserved.